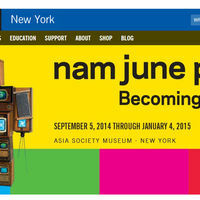 Nam June Paik (1932–2006) was a visionary artist, thinker, and innovator. Considered the “father of video art,” his groundbreaking use of video technology blurred past distinctions between science, fine art, and popular culture to create a new visual language. Paik’s interest in exploring the human condition through the lens of technology and science has created a far-reaching legacy that may be seen in broad recognition of new media art and the growing numbers of subsequent generations of artists who now use various forms of technology in their work. The artist was born in 1932, in Seoul, Korea. He moved to Germany in 1956 to pursue his study of music, and then to New York City in 1964. Upon his arrival Paik quickly developed collaborative relationships with a circle of now iconic American artists—John Cage, Merce Cunningham, Yoko Ono, and Bill Viola, among others—and spent the duration of his career, which spanned four decades, in the United States. Through his progressive ideas and artworks, the artist dared to imagine a future where today’s technological innovations might exist, and it is this pioneering vision that has continued to shape contemporary visual culture in the United States and internationally. Nam June Paik: Becoming Robot is the first exhibition dedicated exclusively to the artist to open in New York City in more than a decade, and focuses on Paik’s process and his philosophy toward technology, especially the relationship between technology and the body, and the intersection of technology and culture. The exhibition presents key works from public and private collections in the United States, Europe, and Asia to show one artist’s perspective on modern society’s dependence on technology. Paik’s wildly creative artistic practice and his innovative working methods provide a backdrop for visitors to contemplate the central role technology will continue to play in art and culture for future generations.